Drinking Alcohol With Diabetes: What Are the Facts? Living with diabetes, especially when it is first diagnosed, can be a minefield as you discover the list of potential lifestyle changes is longer than you first thought. I think if you asked people without experience with diabetes to name three drinks or foods a diabetic should avoid, most of them would name candy, cake, and cookies. Thinking about drinks they might name soda, but I wonder how many of them would mention beer, wine or spirits — which can be deadly for those with diabetes. Don’t panic! I’m not suggesting people with the condition should never drink a drop of alcohol. You can still enjoy champagne at a wedding or a cold beer at a barbecue, but alcoholic drinks very much have to be monitored to avoid potentially dangerous sugar spikes, sending blood glucose high or low. Interestingly, the way your body reacts can depend on what form of alcohol you enjoy. Some drinks — like beers, ales, and ciders for example — contain carbohydrates and will increase your blood glucose levels for a short period of time. Spirits, dry wines, champagne, and other sparkling wines may not have the same effect — some may even lower your blood glucose levels. The general advice is for those with diabetes to drink sensibly as defined by government guidelines, eat a healthy diet and exercise regularly. American health professionals suggest safe limits are up to one drink a day for women and up to two drinks a day for men. Drinking heavily can also increase the chances of you having a hypoglycemic episode (when blood sugars fall dangerously low), especially if you have been drinking on an empty stomach. It is more likely if diabetes is treated with insulin or certain diabetes medications. The liver helps keep blood glucose steady, but if your liver is busy getting rid of lots of alcohol, it can’t do this effectively. This can cause your blood glucose to drop and stay low until the alcohol is metabolized, which explains why you crave carbs and wake up the next day with a headache. The risk of a hypoglycemic episode increases shortly after drinking alcohol and can last up to 24 hours after drinking. Another reason to avoid overdoing the alcohol is the fact that if you have diabetic neuropathy (nerve damage as a result of diabetes), drinking alcohol can make it worse and increase the pain, tingling, numbness and other symptoms. It’s a sobering thought (pun intended!) and although this all sounds rather frightening it really is OK to indulge in a tipple every now and then as long as you don’t binge drink or exceed recommended levels and take some sensible precautions. Eat a healthy meal before drinking and keep a track of what you are drinking. There are even apps which will help you keep a track of how many units of alcohol and calories you have consumed. When you see how many burgers or donuts your alcohol intake equates to in one evening it might be enough to help you stick to diet sodas after you’ve reached the recommended limit. You might also like...Is It Possible to Reverse Type 2 Diabetes? Keep an eye on the alcohol by volume (ABV) of your drinks. ABV can vary hugely even between different varieties and brands of wine and beer. For instance, some strong beers can contain up to three units of alcohol in one bottle. Don’t be afraid to ask your bartender about the strength of the drink you plan to buy. If you are drinking at home or at a friend’s home, make sure you properly measure your drinks. 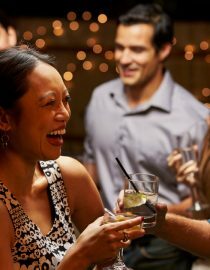 There have been cases where someone with diabetes has had an episode while out partying, but people around them assumed they were just drunk. Diabetes dizziness and associated loss of balance, changes in mood, and slurred speech are common diabetes symptoms — you can see how this might look like drunkenness. It’s important to let people you are drinking with know you have diabetes, to carry emergency medications, medical ID and supplies with you even on a night out, and make sure someone with you knows what to do in the event of a possible hypoglycemic episode. You could keep glucose tablets, a small bottle of sugary drink, or a tube of GlucoGel with you — a couple of glucose tablets won’t take up much room even in the smallest handbag or jacket pocket. It might be wise to check blood glucose levels using your finger-prick monitor regularly and adjust medication according to the readings if possible. Make sure your friends know it’s important to seek urgent medical help if there is any suspicion your symptoms are caused by falling blood glucose.